It is the number of independent coordinates required to describe the position of a body in space. A free body in space can have six degrees of freedom. i.e., linear positions along x, y and z axes and rotational/angular positions with respect to x, y and z axes. In a kinematic pair, depending on the constraints imposed on the motion, the links may lose some of the six degrees of freedom. 1. Three translations along x, y and z axes. 2. Three rotations about x, y and z axes. So an object in free space has six degrees of Freedom. A fixed object has zero degree of freedom. Rigid bodies and kinematic constraints are the basic components of mechanisms. A constrained rigid body system can be a kinematic chain, a mechanism, a structure, or none of these. 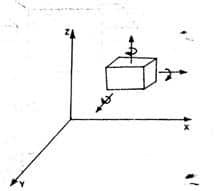 The influence of kinematic constraints in the motion of rigid bodies has two intrinsic aspects, which are the geometrical and physical aspects. In other words, we can analyze the motion of the constrained rigid bodies from their geometrical relationships or using Newton’s Second Law. Degrees of freedom/mobility of a mechanism: It is the number of inputs (number of independent coordinates) required to describe the configuration or position of all the links of the mechanism, with respect to the fixed link at any given instant. n = Number of links = n2 + n3 +……+nj, where, n2 = number of binary links, n3 = number of ternary links…etc. l = Number of lower pairs, which is obtained by counting the number of joints. If more than two links are joined together at any point, then, one additional lower pair is to be considered for every additional link. Here, n2 = 4, n = 4, l = 4 and h = 0. I.e., one input to any one link will result in definite motion of all the links. Here, n2 = 5, n3 =1, n = 6, l = 7 (at the intersection of 2, 3 and 4, two lower pairs are to be considered) and h = 0. Here, n2 = 5, n = 5, l = 5 and h = 0. I.e., two inputs to any two links are required to yield definite motions in all the links.